What is US nonfarm payrolls? The single most important number on this planet is US non-farm payrolls. This measures the rate of change of US employment, that in turn drives the US equity and bond markets and US central bank policy. US markets and central bank policy ripple throughout the World which means this single number is the most important monthly indicator to watch. Total Nonfarm Payroll is a measure of the number of U.S. workers in the economy that excludes proprietors, private household employees, unpaid volunteers, farm employees, and the unincorporated self-employed. This measure accounts for approximately 80 percent of the workers who contribute to Gross Domestic Product (GDP). The importance of the nonfarm payroll number is that it captures eighty percent of the workers who contribute to US growth. As its name suggests it excludes farm employees but also other categories such as unincorporated self-employed people. This is what total nonfarm payrolls since nineteen forty looks like: it's just about to approach a hundred and fifty million people. The absolute number is seldom quoted, instead investors look at the monthly change which is shown below. The vertical gray bars in the graph are recessions in the United States and it's clear that during a recession non-farm payrolls drop. This is because of the fact that during recessions workers are laid off. While unemployment is a lagging indicator, in other words it doesn't give you a forward-looking indicator of growth, if we look at the rate of change of employment we have a coincident indicator. This means that payrolls provides a regular and accurate snapshot of what's going on with the US economy. But this is a number for the US, why should investors elsewhere in the World care? We all know that the US economy is very large but a more surprising and lesser known fact is the relative size of US equity markets relative to the rest of the World. Take a look at the rankings from 2015 and you'll see that the US market is disproportionately large. 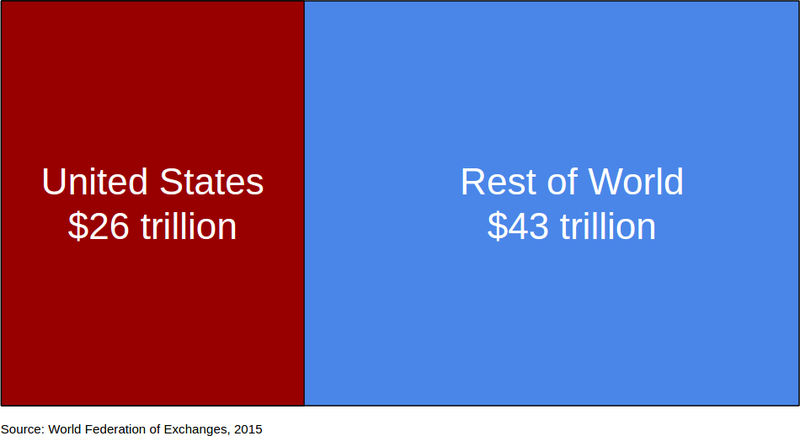 In fact US shares make up about a third of the global $69 trillion market. In case you weren't shocked here's the same information represented graphically. So how come payrolls is so important? The chain of reasoning is as follows: if payrolls are rising that means businesses are hiring, which means businesses are expanding, and all those newly employed people have increased disposable income some of which they spend to boost consumer consumption. This increase in demand spurs earnings growth for corporates. Rising payrolls paints a positive picture for the US economy. But you have to be careful because if payrolls are rising too quickly that can lead to runaway inflation, which is generally a bad thing for stock prices. The largest global investors are institutional investors, which includes pension funds, insurance companies, and hedge funds. They will be watching this payrolls number each month and will trade on its value which means that markets will respond to any surprises. 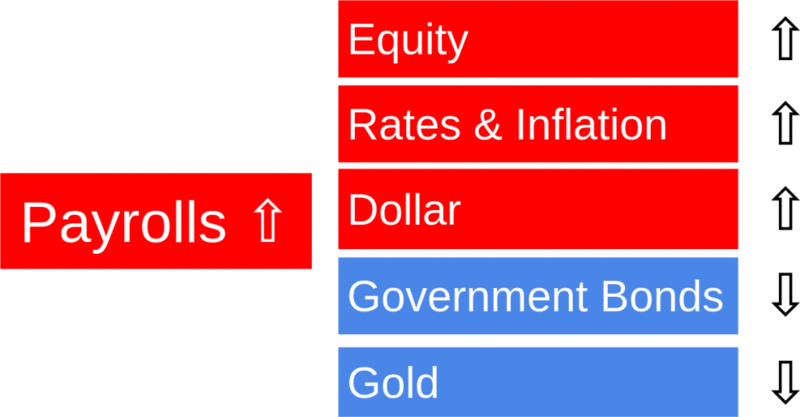 If the payrolls number is strong equity rallies, people expect interest rates and inflation to go up, that in turn drives up the value of the dollar versus other currencies and if interest rates go up the price of government bonds goes down so this is bad news for the government bond market. And the mortal enemy of gold is high interest rates so a good payrolls number is generally bad for gold. The place to look for the number is on the Bureau of Labor Statistics website that's https://bls.gov. 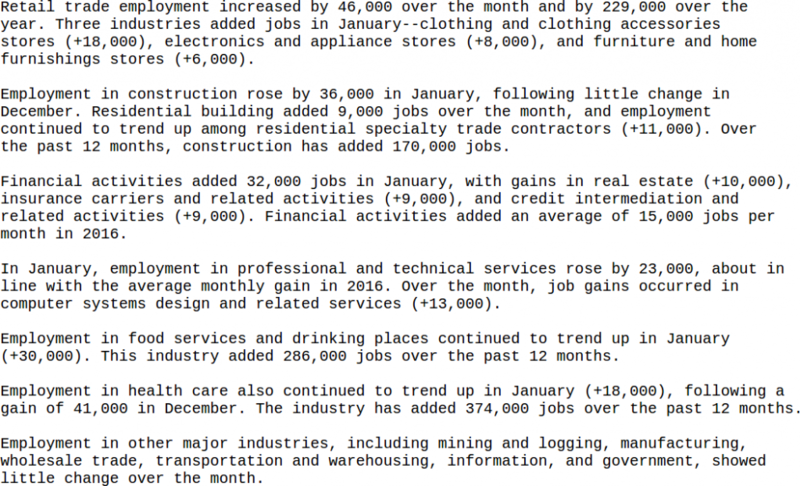 They BLS publishes employment data on the first Friday of every month. Don't be put off by the format of the report, it's the most boring presentation you'll ever find, but if you read through the text you'll find treasure. The report contains data from two different surveys: Household Survey data, which breaks down unemployment by race, by long-term unemployed and short term unemployed, marginally attached workers and discouraged workers. But we're going to concentrate on the Establishment Survey which we'll break down into four parts. Firstly let's look at the headline that's the monthly change in non-farm payrolls. 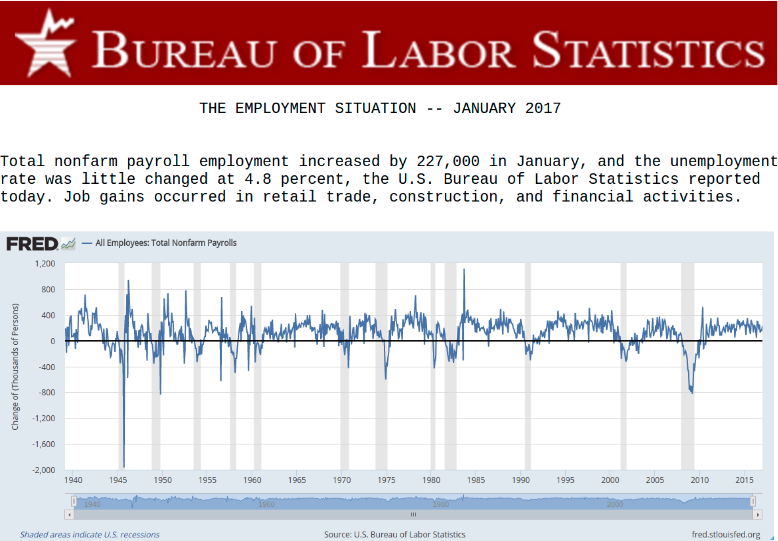 You can see in January 2017 employment rose by 227,000. That's the number you'll see being tweeted and discussed. Remember this is the monthly change, and as there were 146 million total nonfarm employed at this time that's just a 0.2% change but scales up to almost 3 million new jobs per year. 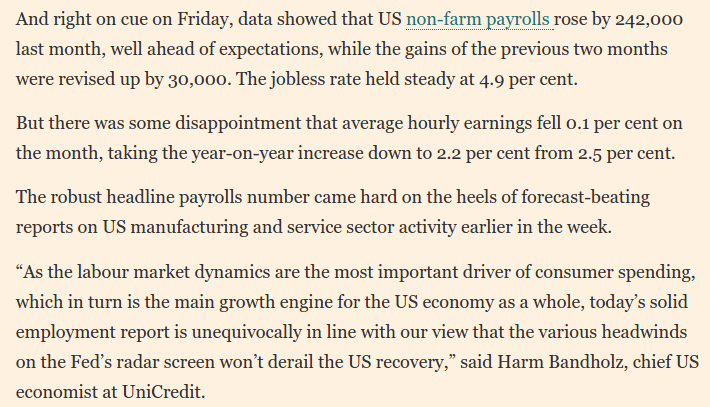 To illustrate what the important parts of this number are and how they are interpreted by markets let's look at this FT article from 2016 when nonfarm payrolls rose by 242k. You'll notice the article talks about "expectations". If people were expecting 230k and the number comes out at 242 then markets will be positively surprised and the impact of that number will be greater. If it's below expectations you'll get the opposite so you always have to know what the expectations are before the survey's published. Another key thing is that the previous surveys are revised, so you may see the previous month's number increased by 30 thousand which in this case meant a retrospective positive surprise because it was revised upwards. But of course it's not just how many people are employed it's also their average hourly earnings that matter and this report was a little bit disappointing because the average hourly earnings fell. And the article also highlights the fact that labor market dynamics are the most important driver of US consumer spending which is the main growth engine for the US economy as a whole. 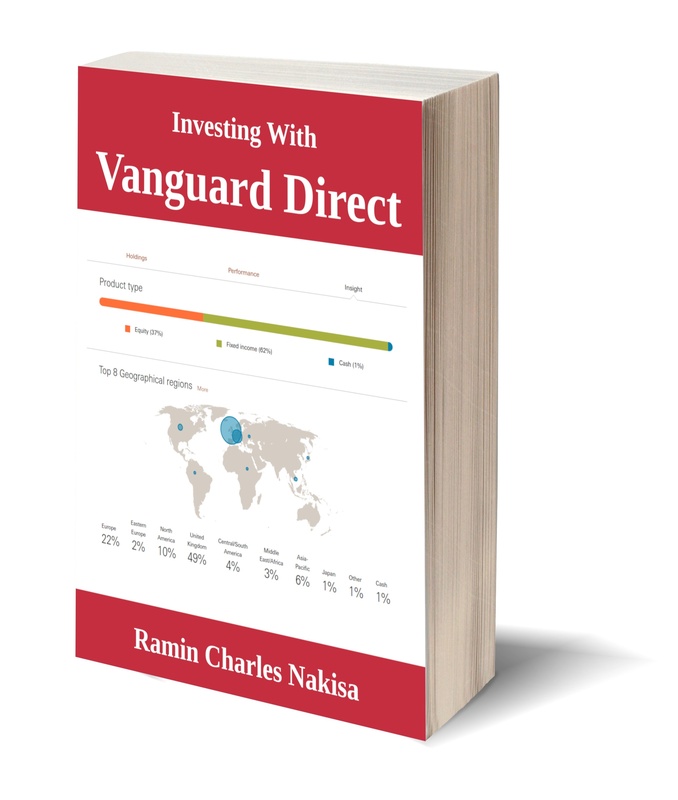 If you invest in single stocks then you'll be very interested in the next section of the report which breaks down the numbers by sector so there's retail trade, construction, financial activities and other major industries. Bear in mind that the US economy is dominated by services which carry a roughly 80% weight in overall growth, so those are the sectors to watch. Then we have the section with the average work week, that's the number of hours each employee worked on average per week, and we're looking here for an increase in the average work week. And another key statistic is the average hourly earnings and again we're looking for an increase in the hourly earnings because that would be seen as being positive. In the last section you see the revisions in data from previous months and that can hold positive or negative surprises so always look at the bottom of the document. And then finally at the bottom you see the date and time of the next report. Do you agree with us - do you think nonfarm payrolls is the most important number on the planet? We'd love to know! Tweet us @PensionCraft, or message us on Facebook.